It’s hard to keep track of the changing trends and fads with toys, which is why I love the simplicity of objects that are timeless hits with kids. Take the cardboard box — the possibilities for creativity are endless, even a 3D nature suncatcher! If you haven’t already, check out the beautiful book Not A Box, by Antoinette Portis. It cleverly shows that a box is never just a box in a child’s mind. 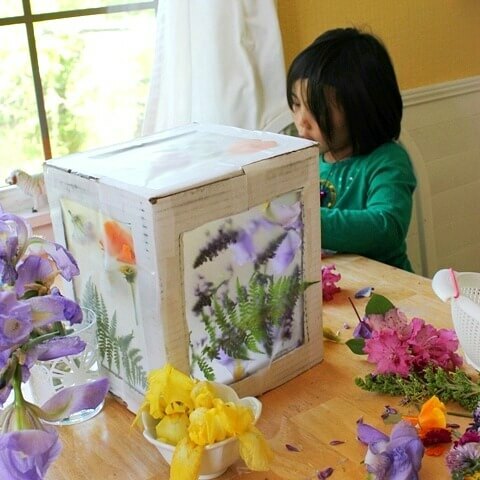 Boxes are brilliant excuses to get creative, so when we were invited to collaborate in TinkerLab’s box challenge, we turned to two favorite sources of inspiration—art and nature. I have to say that after Maia, her friend Stella, and Daphne finished crafting this 3D nature suncatcher, a humble corrugated cardboard box never looked so magical and elegant! Just like the box it started with, our resulting creation isn’t limited to one description. It’s a 3D nature suncatcher, a flower petal art box, or a flower house for fairies and fireflies. It’s also a 3D stained-glass viewer and potentially a lamp shade or shadow box. By the end of the day, it had even become an enchanting light-filled stable for Maia’s toy horse. Here’s how we made this 3D nature suncatcher from a cardboard box, as well as some simple flower petal stained glass windows from the leftover cardboard. While I did the prep that involved the sharp x-acto knife and applying the sticky contact paper, the girls completed the rest of the project. *You can also find contact paper with the shelf-lining paper in grocery stores, drug stores, and places like Target and Walmart. Step 1 :: I started with a simple cardboard box. It was relatively small so I taped the flaps up using packaging tape. Then, with an x-acto knife, I cut rectangles out of each side, leaving an inch or two of cardboard “frame” around each opening. Step 2 :: Then I cut pieces of transparent contact paper to cover each of the framed openings. I applied the contact paper to the inside of box with the sticky side facing out. Note for younger kids: The cardboard that might normally be discarded is especially useful for occupying the youngest kids. For example, I turned the rectangles that I cut out from the box into frames themselves, with contact paper attached, for 2D suncatchers. Meanwhile, Daphne enjoyed drawing on the centers of those frames as I finished setting up the project. Step 3 :: The girls collected flowers, leaves, and ferns from around the garden for the 3D nature suncatchers. Step 4 :: We piled their collections in the center of the kitchen table. The kids went to work attaching them to the sticky contact paper on the box and within the frames. The girls experimented with what worked and what didn’t. Maia applied whole flowers but discovered that they didn’t stick as well as individual petals. Stella used her scissors to cut flower petals and leaves into smaller pieces to apply to her framed triptych. Step 5 :: Finally, we added another sheet of contact paper over the top of the flower petals to seal the panels. 1. First, we held the nature suncatchers up to the windows to see the light shine behind the colorful, translucent flower petals. The colors and shapes were so vibrant! 2. Then we temporarily replaced a lamp shade by holding the 3D nature suncatcher over the bulb to see how it looked with a light source inside. Very cool! It would be fun to rig up something with wire to hold it safely in place over a low-wattage lamp more permanently. Or, simply place a no-flame battery operated candle inside the cardboard box. 3. We also went outside and looked up through the box towards the sun, to see how it looked with the light source coming from above instead of from inside. Also beautiful! Finally, the cardboard box nature suncatcher became a light-filled stable for Maia’s little horse figure. This 3D nature suncatcher was such a fun project to do on so many levels! It inspired the girls to explore and appreciate nature, make artistic arrangements, and consider different light sources. If you want to create a more permanent version, you could press and dry the flowers and leaves first. If you do make your own cardboard box suncatcher, whether with fresh or dried flowers and leaves, please share a photo in the comments below. I’d love to see what you come up with! We are grateful to have been invited by TinkerLabs to design this cardboard box beauty. If you’d like to check out the clever ideas that 23 other participants came up with, take a look at the TinkerLab’s box challenge. WOW! Jean, you girls are SO creative. I love that you used the entire box, that there was a separate age-appropriate activity for Daphne (how thoughtful! ), and that Maia’s dress looks like it took inspiration from the project. :) The colors are striking and it looks like so much fun. We will definitely do this one day this summer.Thanks for being part of this project, and for the ongoing inspiration! Oh my! That is BEAUTIFUL!!! AMAZING! This is just pure magic. Consider yourself a fairy charmer, bringing fairy magic to earth. lovely! can’t wait to try this! This is SO AMAZING! You always have a great surprise up your sleeves! We just did a couple Contact Paper Nature Collages inspired by you!!! This box tops our idea! Thanks for your inspiration as always!!! I look back from a year ago and so many things I have done with my daughter were inspired by you!!! Thanks!! wow that is super fun and beautiful!!! BEAUTIFUL!! would love to try something like this, thank you! Ah yes… there I am.. Making so many “mistakes” today… don’t know *where* my head is!!!! I do love your box though. Pretty special! WOW!! Beautiful! Wonderful use of a cardboard box – I’ve done it before with the cardboard frame (http://strongstart.blogspot.com/2010/04/nature-art.html) but the whole box would allow it to be a communal effort. wow! this is so lovely! i’m always inspired by your use of light with your suncatchers, and this brings that sort of glow into the night! i love how it matches the skirt you and maia made. amazing art, as always! xo & happy mothers’ day weekend to you, jean! That is soooooo beautiful! I loved when the kids lit it up with artificial light. Just gorgeous! First you gather the flowers and ferns leaves (they work especially well). Attach individual FLATTENED petals or whole flowers and whole leaves with masking tape to a white or almost white t-shirt. Cover the entire flower/leaf with pieces of masking tape so none is exposed. Then you hammer the entire leaf/flower masking tape shape on a hard surface like your driveway. When you take the tape off, the flower will be history but a permanent implant is on the shirt. Certain flowers work better than others. AND the cool part, it should be permanent…at least the fern leaves are. We have t-shirts we did years ago that still have the fern leaves on them…really big ones. It’s so cool. Works on small pieces of fabric as wellthat we made into a banner. Sorry, I don’t have any pics. Try it!!! Una preciosidad, divertido, bonito, y práctico.Mis felicitaciones. Here’s your comment, Maggy! It made it just fine! Oh, I’ll have to look for one of those! Thanks for the idea! Fun! Yes, we love contact paper nature collages too! Ooh, yeah! it would be a perfect joint project on a preschool playground! Hmm, we have an Ikea wall-mounted moon lamp. Maybe if we take the moon off and hang the box over the bulb? I think the previous people have all said exactly how I feel, it’s beautiful!!! This is simply brilliant! I love the way it can be explored at anytime of the day in any light – just fab! Can’t wait to have a go at creating one soon – thank you. This is so lovely and magical. What a fantastic idea! Yes, I thought lampshade too!!!! There’s so much for them here – connection with nature, observation, artful arrangement.. Such a great idea!I think this is the type of craft the kids will never forget. I will definitely try it with my kids! thank you! What an impressive use of a box. I love that none of the cardboard went to waste. Contact paper is one of my favorite materials. I can’t wait to make our own flower box. How beautiful! I’m curious about how well the contact paper stuck to the box while the flowers were being applied. I imagine frustration happening if it came unstuck…? Jean, this is beautiful. There are so many wonderful processes here. Just collecting the flowers would have been a wonderful afternoon outdoors and then to make this beautiful box, just perfect. Wow! This is really stunning and looks like it was an absolute blast to put together! Thanks so much for the how-to, I’ll be linking. I LOVE the idea of the cardboard frames! I’ve been looking for a way to let the girls make contact paper art that allows for a more permanent display, and I think this idea is is! This is such a great idea! I’ll have to try this with my girls. My 2 year old is obsessed with flowers right now, so it would be so much fun. Nice idea for activities! I’ll be sharing this. GREAT project! I think I love your blog even more after this post…and I didn’t think that was possible. This is so pretty! I love it and want to try. Thanks for sharing. Absolutely awesometastic- my kids will adore doing this (as will I) and it will be a perfect way to spend a summer afternoon together that all can participate in, from the smallest to the tallest, Thank you so much for sharing such a creative and fun idea! You arts and crafts ideas rock! I love them and am inspired to do more with the kids in my life. Thanks every so much for terrific kid pleasing idea.